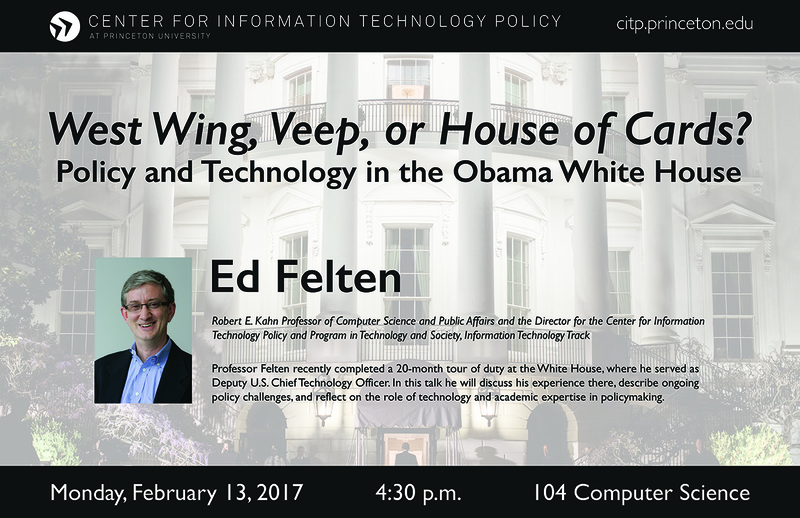 Professor Felten recently completed a 20-month tour of duty at the White House, where he served as Deputy U.S. Chief Technology Officer. In this talk he will discuss his experience there, describe ongoing policy challenges, and reflect on the role of technology and academic expertise in policymaking. 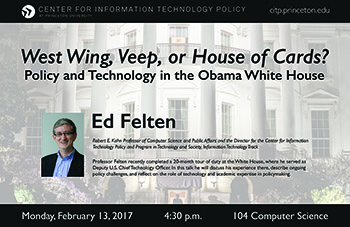 Edward W. Felten is the Robert E. Kahn Professor of Computer Science and Public Affairs and the Director for the Center for Information Technology Policy and Program in Technology and Society, Information Technology Track. Ed served at the White House as the Deputy U.S. Chief Technology Officer from June 2015 to January 2017. He was also the first chief technologist for the Federal Trade Commission from January 2011 until September 2012. Ed’s research interests include computer security and privacy, and public policy issues relating to information technology. Specific topics include software security, Internet security, electronic voting, cybersecurity policy, technology for government transparency, network neutrality and Internet policy. He often blogs about technology and policy at Freedom to Tinker.